I hate werewolves. This movie is no exception. The special effects are basic and trite in this adaptation of Stephen King's short story. What's the best part of the movie? Gary Busey of course. This movie is about Marty (Corey Haim), a young kid that loves fireworks, poker, wrestling, and hanging out with his uncle (Busey). Did I mention that Marty is in a gas powered wheelchair. Strange things have been happening in Marty's small town. People have been dying left and right. There are murmurs of a werewolf, but that is crazy right? Werewolves don't exist! That is until Marty comes in contact with the creature. Now he has to warn everyone before it is too late. The special effects in the movie are not the best. The transformation scenes are ridiculous and the werewolf himself isn't the scariest looking thing. He is a huge, hairy, humanoid with a blood lust. The eyes are really cool and he is a huge bulking mass of terror. However, he just fails to really connect with me. I can't see the creature as scary. Especially when that werewolf isn't just ripping people to shreds. He is actually using weapons. The werewolf using the baseball bat to kill someone was really stupid. I wasn't expecting this movie to be fantastic and it doesn't really need to be. It's a Stephen King movie. That should be reason enough. The nostalgia factor sets in when your watching it and you find yourself entranced. You can't switch it off. Everything from the cameos of Terry O'Quinn and Everett McGill, to the cheesy lines spewed by Gary Busey or Corey Haim, keeps you watching. 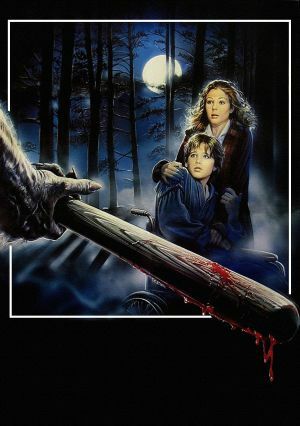 This isn't a good werewolf movie, but this is an awesome eighties flick. What is it, Bobby? You gonna make lemonade in your pants? The film has been panned for not having enough to do with its setting. The movie is set in 1970's New England. However, no one speaks in an accent or mentions anything about the area. You can also see 80's cars driving around in the background. This is a minor gripe to me, but to others it is a big deal. In the scene right after Marty shoots the werewolf in the eye and rides back to his house, you can very obviously see his legs moving when he climbs from his window to his bed, even though he is supposed to be paralyzed from the waist down. The narrator of the movie claimed that the full moon in 1976 fell on October 31. This incorrect as the moon was just past half on October 31, 1976. They also said that the moon had not set yet and that it was already 3:00 AM. Moon set October 31, 1976 was at 1:42 AM.